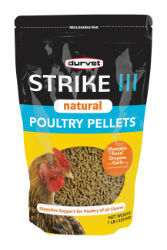 Mix 1 lb of Strike III Natural with 50 lbs of feed or mix 2 teaspoons per 1 lb of feed daily for 5 average size chickens. No egg or food withdrawal. Yeast Culture (Saccharomyces cerevisiae), Pumpkin Seed (flavor), Wormwood (flavor), Clove (flavor), Oregano (flavor), Garlic (flavor), Montmorillonite Clay, Diatomaceous Earth 0.50% (anticaking agent).